War of the Green Lanterns Conclusion! The Green Lanterns attack the possessed guardians but can’t hurt them. Hal pulls Kyle aside and has him use his artistry to release their captured rainbow lanterns from the book of Black. Hal and Ganthet take on Krona while Kyle is successful in releasing their allies. Their rings seek them out but Krona overrides them so he can wield all the rings. He takes out Ganthet and traps Hal who refuses to give in, his words of courage and emotion reach Sinestro. AS Krona tortures Hal Sinestro attacks the mad guardian even without a ring with no concern for his own life. Krona traps both him and Hal with yellow energy and plans to kill them when a green ring latches on to Sinestro making him a green Lantern again and breaking Krona chains. They both then take the fight to Krona and Hal manages to deliver the killing blow to Krona. There’s a massive explosion and as Krona falls the guardians are released of their possession. Sinestro’s yellow ring flies off ignoring him while the other all get back their respective rainbow colors. In the aftermath the guardians quickly take charge of the situation teleporting all the non green lanterns from Oa. 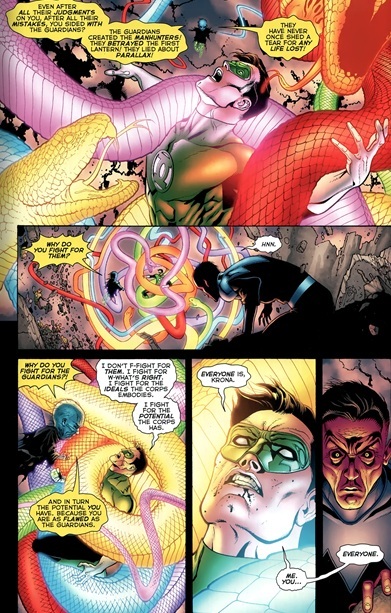 Threatening Ganthet with punishment, reluctantly accepting Sinestro back into their ranks and stripping Hal of his ring and returning him to earth. Sinestro- This issue had Sinestro lose his yellow Ring and picked by a green ring to become a green lantern once more. 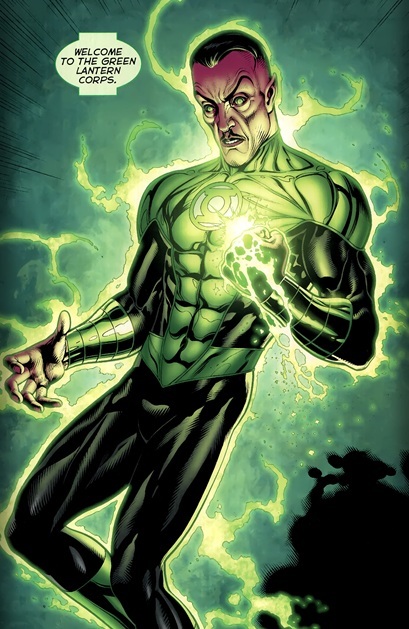 While most found this shocking no doubt it was not unexpected after all he was the greatest green lantern before Hal Jordan and even after the Sinestro Corp War he was confident and pleased that by forming his own corps he had strengthened the green lantern corps by having the guardians write new lays in the book of OA. Sinestro has always had the best interest of the universe as a whole in mind and even strengthening his enemies if they can be used to protect the universe. He has always had the power to overcome fear and instill it. The most interesting thing for me is what will happen to the Sinestro Corp now that their leader is no longer a fellow fear wielder like themselves? Who will rise as the new leader of the yellow lanterns with Sinestro gone? Art- Cool illustrations, nice pencil and ink work, and emotions are conveyed believably and hit all the right notes. Hal-What can be said for Hal except all the problems I had with his character before Geoff Johns took over have been worked out in the years following his resurrection. 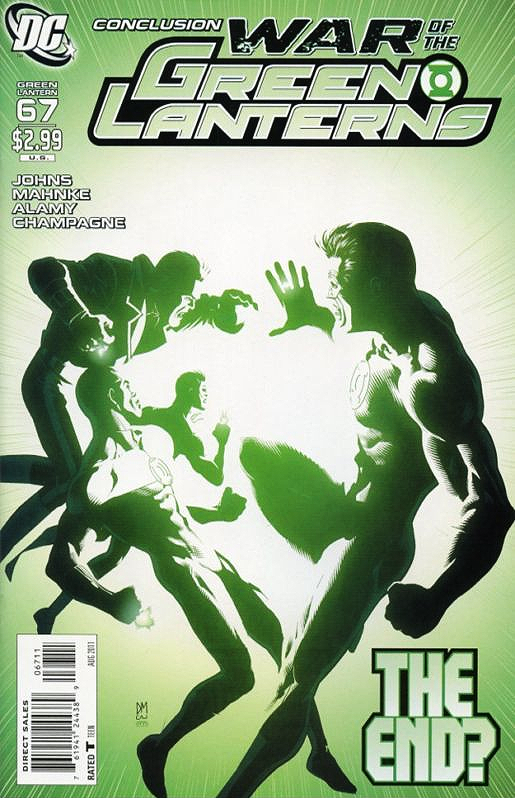 Hal was completely Human and vulnerable in this issue. I’ve never felt any connection to Hal since I started reading him twenty years ago and Geof Johns had me holding on to his every word in this issue. If that’s not good writing I don’t know what is! Cover-Both covers look good but the standard slightly better with the blinding green light all but consuming our earth based Green Lanterns. Action- Fighting and action from start to finish sure to keep action junkies immensely entertained from beginning to end! Kyle- After being of little use in the lead up to this conclusion Kyle is pivotal to the release of the heads of the various corps from the book of black by way of drawing in the book for the desired outcome. Awesome use of my favorite Lantern! Holy plot twist Batman! ?- Hal Jordan is kicked out of the Green Lantern Corp while Sinestro is welcomed back? Hell yeah!!! Impervious- its stated during the fight between the possessed guardians that they are invulnerable to the rigs of the green lanterns…..um Ganthet is a guardian and he was ganged up by the green lantern corps in this very storyline, so either someone forgot to say “the guardians are invulnerable now that they are possessed” or someone forgot that the fate of Ganthet was in question because of a plot point now rendered moot in this concluding issue.